The SiteSee new shapefitting algorithm is showing vast improvements on imperfect digitaltwin models for Telco. Creating accurate reality models are challenging, but 3D object recognition is significantly more challenging. Reality models will never be perfect. These model imperfections lead to further errors in the object recognition. The new shape fitting algorithms allows for imperfect reality model or 3D mesh, and applies intelligent fitting of a shape to the reconstructed mesh. This technique provides a very accurate equipment recognition in all three dimensions. We planning to expand the shape fitting to other equipment types in the coming months. SiteSee has been nominated as a finalist for the Bentley Year In Infrastructure 2018 awards. CEO Lucio Piccoli will be presenting how Artificial Intelligence and Reality Modelling has made Telco tower inspections safer, cheaper, more accurate and perform at scale. SiteSee has made a vast improvement in the automated object recognition algorithm used for Telco equipment recognition. The new algorithm is showing improvements in accuracy for all classification of objects. The image below demonstrates a fully automated 3D scene, highlighting the different recognised object types. The improvement is transferable to other object recognition types beside Telco equipment. SiteSee will be using this algorithm on Oil&Gas objects very soon. The images below have been automatically detected and recognised using SiteSee 3D object recognition. There has been no manual touch up. The red indicates antenna panels, purple is RRU/Box/BOB/RET, green is tree, blue is building. "How is AI making an impact for infrastructure owners and operators?" Find out from four leaders in AI , how their AI technology is providing industry solutions - right now. Join us as we hear from each speaker followed by a panel session moderated by Alex Moss. This is an opportunity for AI technologists and the infrastructure industry to solve real world problems with great AI technology. Free food and drink provided. “How accurate is 3D photogrammetry model without Ground Control Points?” This question is often asked by our customers but there was never a definitive answer, until now. But first some background on Ground Control Points (GCP) and why they are used. 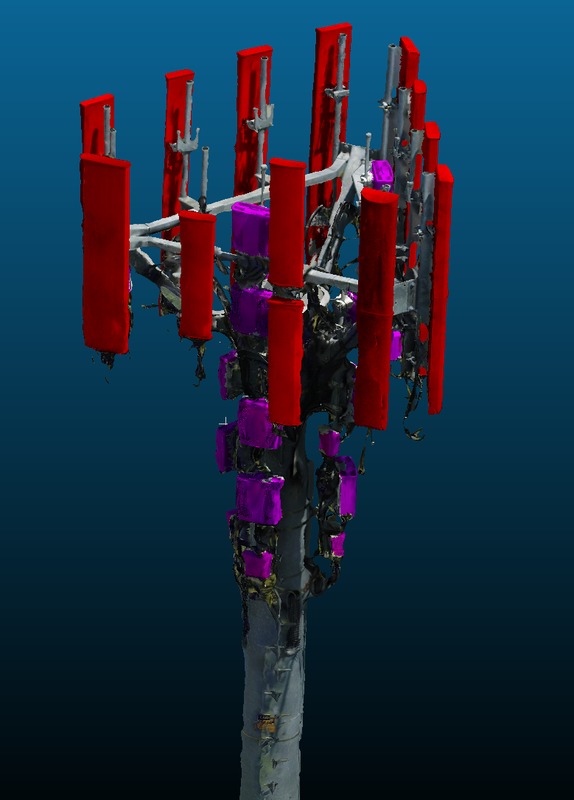 GCP’s are currently used by SiteSee to ensure both accuracy scale and orientation of 3D models of cell towers. GCP are static markers that accurately identify a point on the earth’s surface. These markers are typical using GPS with a correction network to provide very accurate static positioning. In the photogrammetry processing these markers are identified in the imagery and given an accurate 3D position. The bundle adjustment is now constrained by these fixed points, allowing for a more accurate 3D model. The 3D model characteristics of dimension scale and angle are important for the SiteSee automated object recognition system. The scale determines the size of each of the three dimensions. For cell towers the most important dimension is along the vertical (z axis), as the height of the cell tower equipment is one of the most important measurements. The orientation of the cell tower allows for accurate absolute bearings and tilts of equipment. This accuracy comparison will use a single acquisition data set of a cell tower. The only difference between the photogrammetry results is one processed with GCP the other without, allowing for a simple comparison. This experiment is not meant to be an exhaustive exercise in surveying. But rather a short, sharp determination of the suitability of the SiteSee photogrammetry model’s accuracy without GCP compared to using GCP. It will measure points between two identical elements of a Telco lattice tower on two 3D models prepared by SiteSee using Photogrammetry, UAV and with/out GCP. In a previous article the high relative accuracy of the photogrammetry with GCP a Lieca Laser Scanner has been demonstrated. http://www.sitesee.io/news/2018/3/12/photogrammetry-verus-lidar-accuracy. Hence the reference dimensions will be from 3D model with GCP. The two model elements being measured are; a) underside of a gantry (Figure 1) to b) the underside of the steel resting on the footing (Figure 2). Although there is three dimensions of each point, however this experiment is concerned with the major dimension of the telco tower, the vertical or z dimension. Photogrammetry: DJI Phantom 4Pro, 5xPropeller Aeropoints, Context Capture v4.4.8.561. Photogrammetry: DJI Phantom 4Pro, NoGCP, Context Capture v4.4.8.561. Measurement software: CloudCompare V2.91 64bit. The tower was flown with a DJI phantom P4, using the Drome Harmony autopilot app. Propeller Aero points were used to for Ground Control Points (GCP). The flight plan follows SiteSee proprietary vertical structure flight plan. Approximately 1500 images were captured. ContextCapture was used to perform the photogrammetry. No manual tie points were used. The resulting model was a mesh in OBJ format with texture. The comparison of using GCP versus not using GCP will be performed using the data used in the above but without the GCP included in the Aero Triangulation phase of the photogrammetry processing. The scale accuracy results shown in Table 1, demonstrate a difference of -0.855m over 50m between the GCP and No GCP models. This figure seems surprisingly low. However, when considering that majority of cell tower equipment is located at the top of the tower, the error in the equipment is significant. To determine relative orientation between the models, points along an external member will be used See Figure 4. Points will be selected on the outside of the member, one near the base the other near the top. This will allow the comparison of the orientation of the same external member between models. Using the “dot product” below; calculates the smallest angle between the vectors that describe the external member. The result is a surprising <1 degree difference. See Table 1. The comparison of a photogrammetry model reconstruction using GCP vs NoGCP has produced reasonable accuracy based on measures of scale and orientation. The scale difference will become an issue for any accurate vertical measurement such as Telco towers. The orientation difference seems to be far less and may not be that significant for some applications. However, for automated object recognition these accuracy differences mean that GCP will still be used for data acquisition and processing, to ensure accurate “As-built” of Telco assets. At SiteSee, a common question asked of us is "what is the accuracy of your photogrammetry model?". For tower infrastructure owners & co-locating tenants concerned with accuracy of information - this is a justified question. This article outlines SiteSee's methods in answering this question. It is important to note that this article is comparing accuracy not precision. For a good explanation of the difference between accuracy and precision please click here to for a detailed article written by James Dunthorne. To summarise, the accuracy is the difference of the means, and the precision is the standard deviation of the measurements. While the question seems simple enough, it is difficult to answer. I was expecting a simple answer like “+-Xmm”. It is not that simple. Accuracy requires a reference or known measurement for comparison. This is a problem, as we are measuring real world infrastructure in the real world environment. Real world means the wind moves the structure, the sun heats and expands the steel structure - thus changing the dimensions. Hence the expected variation would limit the overall accuracy of any measurement method. This experiment is not meant to be an exhaustive exercise in surveying. But rather a short, sharp determination of the suitability of the SiteSee photogrammetry model’s accuracy compared to the industry bench mark of a Lieca Laser Scan. The results are surprisingly close given the laser scanner is $140K compared to the photogrammetry capture equipment costs of $7K. This fundamentals of the experiment is to measure between two elements of a Telco lattice tower with a Laser Scanner and compare it to a model prepared by SiteSee using Photogrametry, UAV and GCP. The reference measurements being used are generated by a Lieca Laser Scanner, which is considered to be a good surveyor quality instrument. b) the underside of the steel resting on footing. There are three dimension of each point, however this experiment is concerned with the major dimension of the telco tower, the vertical or 'z' dimension. Lidar Acquisition: Leica P40, unknown number of scans, .pts file. File Type / Output: .obj mesh model. The tower was flown with a DJI phantom P4 Pro, using SiteSee's purpose built TowerCapture app developed in cooperation with Drone Harmony. Propeller Aero points were used to for Ground Control Points (GCP). The flight plan follows SiteSee's proprietary vertical structure flight plan. Approximately 1500 images were captured. ContextCapture was used to perform the photogrammetry. No manual tie points were used, just the GCP. The resulting model was a mesh in OBJ format with texture. The lidar was captured by CR. Kennedy using the Leica P40. It is unknown how many scans were used. The resulting point cloud was provided in a PTS format. The procedure of measurement was very simple. Select a point in lidar point cloud/mesh using the CloudCompare measure tool, followed by the second point. However, it became evident that identifying the physical edge in the model is far from simple. There is no clear definition of an edge when zooming into the target area. The underside of the gantry becomes a blur of points. This became the first point of error. Edge selection. Rather than performing any post processed edge detection or filtering, this experiment is using the points as they are in the model. It is hoped that it demostrates the complex nature of describing accuracy in a real word model capture. The excellent free software tool, Cloudcompare displays the deltas of each dimension between the two points. For this experiment only the delta Z is of concern. Three sets of points were measured and tabled below. What is striking is that the mean of the sets are surprisingly similar with approximately 10mm difference in accuracy. Although the laser scan standard deviation is double that of the photogrammetry, it can not be used for a rigorous determination due to the small data set of three points. The accuracy result of 9mm is less than the precision of the lidar set. This is a clear indication that the sample set is too small for detailed analysis. However, what is important is the similarity between the lidar and photogrammetry results. So what is the accuracy of the SiteSee model? The answer is going to be very specific. Over 50m vertical, SiteSee's achieves a variation of just +-10mm. Take the statement with a realisation that it is not a simple process to determine real world measurement accuracy. What does this mean for tower owners? Maintaining accurate as-built documentation for tower owners is critical for a number of reasons. Firstly, it ensures equipment has been installed as per design. Current practices lack transparency - relying on subcontractors to install and audit their own work. While it is common for 'spot checks' to be performed on a sample of new builds / upgrades, sometimes non-approved installations fall through the cracks - often only being picked up outside of the typical twelve month contractor liability period. By utilising SiteSee's solution whenever a physical change / upgrade / decommission occurs, SiteSee's infrastructure digital twin & automated as-built documentation helps tower infrastructure owners maximise tower utilisation. The SiteSee solution also provides tower owners with new customer facing services to assist carriers & contractors to make more informed decisions throughout the planning and design phase without having to visit site.